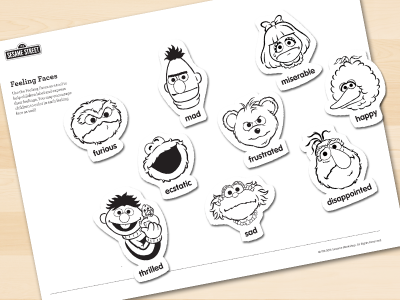 The Big Idea: Children can begin to develop their emotional vocabulary by naming the emotions of their Sesame Street friends. Print this page and point to the different characters. Talk with kids about how they are feeling. You can say, “Look, Big Bird is feeling happy. He’s smiling.” Make feeling faces along with the characters. You can say, “This is my happy face.” Even if babies don’t respond, they’re still learning. Kids can color the page.